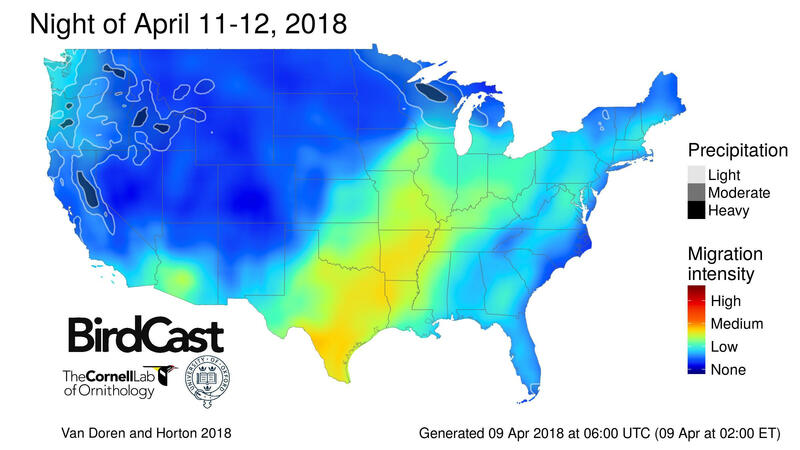 A snapshot of BirdCast's migration forecast. Kyle Horton is a postdoctoral research fellow with the Cornell Lab of Ornithology. He says the maps show nightly predictions of migratory activity one to three days into the future. Horton’s team is drawing on a radar infrastructure he says is fairly unique to the United States. It’s called the NEXRAD system. “These radars are traditionally used for studying meteorology, looking at precipitation, severe storms, but they also capture a tremendous amount of biology,” he says. 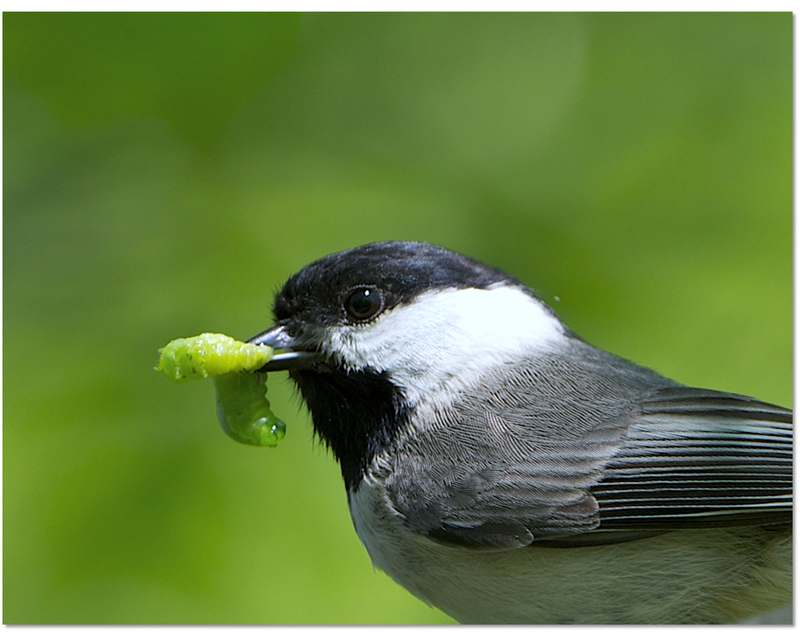 With the data, Horton’s team is able to extract the number of birds that are migrating on a given night and then link this information with atmospheric properties. He says the map shows the intensity of migration. “It can vary night to night. It can vary across the United States,” Horton says. For instance, one night could show intense migration along the Gulf of Mexico, but the next night migration might shut down due to weather events such as a head wind. “Hopefully, those migrants, at least from a birdwatcher’s perspective, would make landfall, and you could go out and observe those birds the next day,” he says. But Horton says they also hope to reduce bird kills. “From a conservation standpoint, we’re really interested in trying to mitigate the impact that some change may have on these migrants,” Horton says. 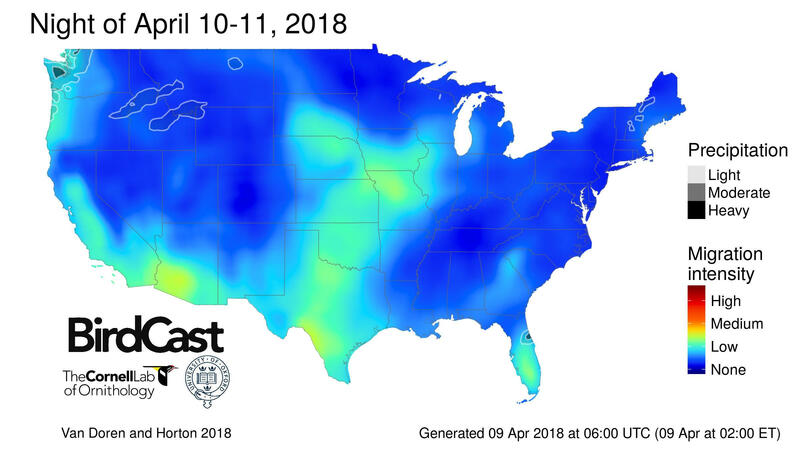 "Let's say a large building, or lights at night, wind turbines; any of those impacts, hopefully we can mitigate those by giving the folks that make those decisions enough of a warning to say, 'There's a large migration coming. If you can make some mitigation strategy available, we hope that that can be in place now.'" You can listen to the interview with Kyle Horton above.